Even after a shower, always bring your camera. A few days back we had our wet season 5PM showers come through, and after taking the dog out for her walk, it was noticed that the sun was just on the right angle. 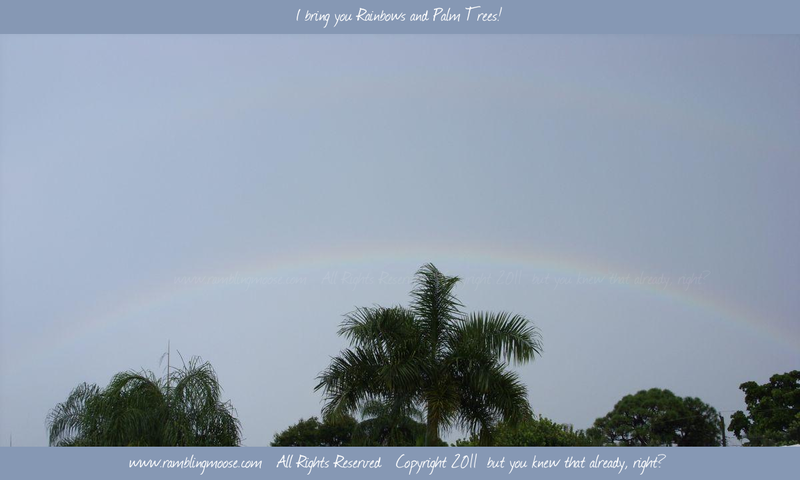 No, it wasn't the Double Rainbow that is the latest internet meme, just this one, overarching the palms in Wilton Manors. A Rainbow in Wilton Manors, some wags may say is Redundant, but it is pretty all the same. After a couple years of taking pictures, some of which are showing up here on the blog, others for personal amusement, there's quite a collection. It raises the question, has anyone ever come up with a truly acceptable way to categorize these things. I have a directory stuffed with the originals in full high definition beauty, and the ones I shrink down to show here as well as the .SVG files I use to create these watermarked pictures I post. I don't care for the watermarks either but I got nervous when I was looking at some artist's website that were affiliated with the Island City Art Walk. They were all watermarked, so I started doing it for my own pictures. After all, if my sister wants one for the background of her PC that's fine. It's still a pretty picture, though. So start your day with a rainbow. Unicorns are optional.